With your home being the most expensive investment you’ll probably make, it’s essential to ensure any serious property restoration issues are dealt with quickly and effectively to avoid long term problems. On many occasions your property’s maintenance insurance will cover structural damage, but if you don’t have this or you’re not covered you’ll need to find another route. Property restorers can deal with anything from the roof, to the walls, doors and windows. Meanwhile, if you want to carry out a refurbishment in your home of anything from the kitchen or bathroom, to the living room or bedroom, you’ll want a professional company to do a brilliant job. When it comes to your property there are some serious issues that can strike and need immediate attention. Two of the main problems facing homeowners are flooding and subsidence. The UK’s abysmal weather pattern means Briton’s can never be prepared for the worst and unfortunately flooding problems are striking all over the country. Water, particularly flooding, can cause major damage to your walls and foundations, and will need to be treated immediately. 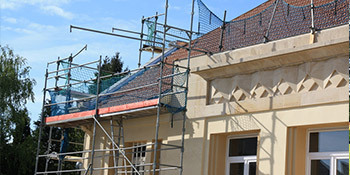 With a property restoration company, be safe in the knowledge that the correct work will take place. Subsidence is another severe problem that affects properties up and down the country. If not dealt with sufficiently, subsidence can be extremely dangerous and you risk putting your property out of action by not having repairs carried out. Whether it’s the kitchen or bedroom, using a specialist for your refurbishment will ensure the job is done efficiently and professionally and looks great when complete. Refurbishment experts allow you to have as much or as little input as you want, taking into account colour styles and designs. Professional property restorers and refurbishers will be able to provide you with a low cost quote for improving your home, taking the hassle out of your hands. No matter how big or small the project is, calling in the experts will help you get the job done quickly and on time. If you’re in need of a property restoration company or refurbisher, complete our quick form below and receive up to four FREE quotes from vetted and reputable specialists in your area. The web site seems to good, but the contacts went wrong.